The water of Siang River in Eastern Arunachal Pradesh is turning unusually muddy every passing day. The people of East siang district noticing this phenomenon since last two month. Lok Sabha MP from East Arunachal constituency, Ninong Ering on Saturday also visited the river site and become Surprised. The water was dirty and muddy , this has never happened in history. Expressing concern over the possible diversion of Siang River by Chinese government at their side at Tibet, Ninong Ering wrote a latter to PM Modi and appealed to raise the issue in international forum and ascertain the exact work going on over Siang River (Tsangpo in Tibet). Ering mentioned in his latter “it could be due to possible diversion of Siang River (Tsangpo in Tibet) by the Chinese government, and urged the Prime Minister to raise the issue in international forum. “The recent report of China constructing a tunnel of 1000-km to divert Siang water to Xinjiang Province and Taklamakan Desert is likely to be true though the Chinese side had denied about it,” Ering said. “There can’t be any other reason of mighty Siang River getting dirty in the month of November, this must have occurred due to heavy land excavation in the Chinese side which has to be verified by an international team to ascertain the ground reality, which, if true, is a violation of international treaty on rivers affecting both India and Bangladesh”, he added. The Lok Sabha member also raised concern over the recent incidents of large scale death of fish in Siang River. He said he got confirmation from upper reaches like Tuting and Geling in Upper Siang which close to Chinese border that the muddy water originates from the Chinese side. “At a time when we are fighting internally for and against the setting up of big hydro project here on Siang River, the Chinese has already built dams over it and now trying to divert it to their desired places which will literally affect the entire Siang/Brahmaputra basin, human population and rich biodiversity,” he said. He has also appealed Ministry of External Affairs and Water Resource Government of India to expedite measures to check such possible diversion of Siang River by Chinese government. According to Mr Ering “There can’t be any other reason of Mighty Siang River getting muddy in the month of November this must have occurred due to heavy land excavation in the Chinese side which has to be verified by an international team to ascertain the ground reality which if true is a violation of international treaty on Rivers affecting both India and Bangladesh”, said Ering while talking to media persons from the bank of Siang River. 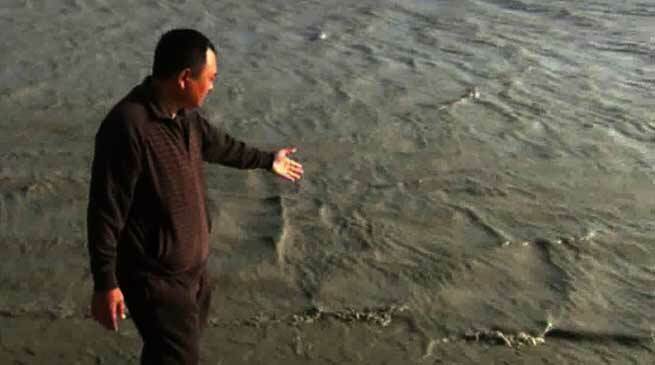 Ering has also expressed concern over recent incidents of fish death on large scale in the Siang River at locations like Tuting and Geling close to Chinese border .